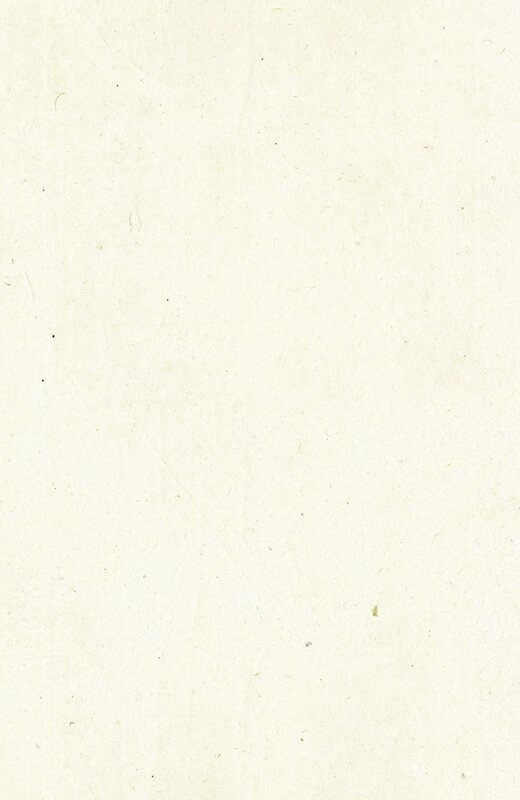 This page shows how to make a stone axe. I made this stone axe as part of the course BIOL350: Aboriginal Impact on Australian Ecosystems, taught by Dr Jim Kohen at Macquarie University, Sydney, Australia. It is known as an edge-ground axe because the stone axe head is ground to a sharp edge, rather than flaked (as would be done using flintknapping techniques). When I was around 9 or 10 years old, I made a great many stone axes. However at the time I had no idea about construction techniques other than what I thought up myself. The difficult part was how to haft, or attach, the stone axe head onto the handle. I used some sort of string or rope to tie them together, or sometimes I used a vine found in the garden as this was more "natural", however they never held together very long. Tools attached to handles are known as hafted, which means "attached to a handle". Edge-ground axes have been dated as early as 25,000 years ago in Arnhem Land, Australia, and 31,000 years ago in Cape York. This is the earliest known use of edge-ground axes anywhere in the world. They were not used in the southern parts of Australia until much more recently, in the last few thousand years. In about the last 1,000 years they became much more popular in the south of Australia. This reflects a change in hunting practices, where large-game hunting was done less in favour of small-game hunting. In the south, much of this small game consisted of arboreal (tree-dwelling) mammals, such as possums. Edge-ground axes were used to cut footholds to climb trees, and to cut into the tree hollows to reach the animals as they slept during the day. 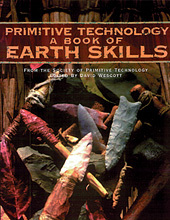 The edge-ground axe was constructed using a combination of traditional materials and methods, and substitutes closely resembling those. 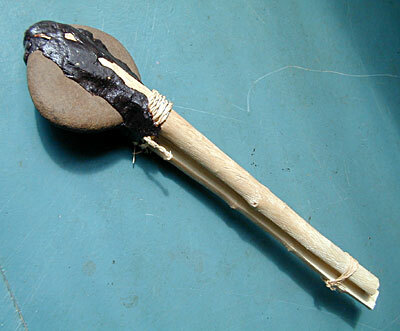 The stone axe is shown below as it was after the university practical class was finished. The axe is basically complete apart from sharpening the stone, as there was not sufficient time in class for this. Privet (Ligustrum spp.) stem was used for the wooden handle. Privet was used because it is a suitable wood, and it is considered favourable to harvest an introduced weed, rather than a native plant as would have been used traditionally. The wood must be freshly harvested (“green”) so it can be bent through 180º without breaking. A number of basalt river stones were provided and one of these was selected for use as the axe head. Basalt was the most common stone used for edge-ground axe heads in the Sydney region, and its most common source was the Hawkesbury river. Chert can be flaked into a very sharp edge but is much too brittle to withstand the pressure of repeated chopping required of an axe head. 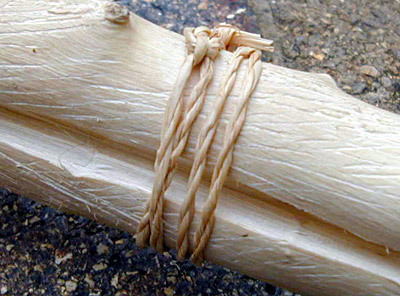 Fibre from the inner bark of the hibiscus bush (Malvaceae family) was used to make the string for tying the axe together. Other suitable plants are Paddy's Lucerne (Sida rhombifolia, also in the Malvaceae family) and Kurrajong (Brachychiton populneus, Sterculiaceae family). Native beeswax was used as a glue to hold the head firmly in place. A modern pruning saw was used to harvest the privet. The most difficult part of the entire process was the splitting of the privet stem down the middle. Several attempts had to be made at this before a suitable split was achieved, that is, one that was reasonably symmetrical and not overly twisted. Once this was done, the centre section of the stem (that which would form the very topmost part of the axe, i.e. the apex of the 180º bend) was thinned out using a rasp. Most of the other students used a sharp piece of stone for this, however my stem was rather thick so I used a blunt metal hand saw as a rasp, which was much faster than using stone. Once this was done the next step was to heat the privet stem so it could be bent through 180º to hold the stone axe head. Heating was done with an old square “Sunbeam” aluminium kitchen frypan that had been filled with sand and gravel and left turned on for a few hours to heat up. Traditionally the hot sand under a fire would have been used for this. The wood was partially buried in the sand, and gradually bent through the required angle. It was necessary to peel away layers of wood from the outside of the shaft, close to the apex of the bend, to allow the stem to bend over a reasonably large radius. This was an important part of the process, without which the stem was inclined to bend in only the one place (the very apex), which would have resulted in the wood breaking. Once the stem was sufficiently bent, a stone was selected and placed inside the apex of the bend, temporarily held in by the pressure exerted by the two handle halves. Cordage was made from the hibiscus bark fibres as follows: First the fibres were wet under a tap. Next they were twisted between the fingers, and folded back over itself so there were two separate bundles of twisted fibres, and these bundles were twisted over each other to make a 2-ply cord. The twisting was continued until the lengths of fibre were entirely twisted into cord. The direction of twisting is shown in the diagram below, taken from “The 10 Bushcraft Books” by Richard Graves. Each inner bundle is twisted in the same direction (in this example clockwise as viewed from the right hand side of the diagram looking toward the left side), and then the two bundles are twisted over each other in the opposite direction to that (in this case anticlockwise). The cordage was then used to tie around the axe head, tightly binding the head to the shaft and holding the two halves of the shafts together. Another piece was used at the opposite (handle) end of the shaft, to tie the two halves together against each other, shown in the picture below. See also the cordage section of this website. Finally, native beeswax was heated using the frypan and moulded around the spaces between the stone and the handle. The stone axe head was not sharpened as there was insufficient time in class for this. If there had been time, the stone would have been ground on a large piece of sandstone under running water (in a laboratory sink). The water washes away dust and allows for much faster grinding.